The common link between vegetarians and part-time vegetarians (flexitarians) is that they like to base their meals on vegetables. Whether this is for health, economic or moral reasons (or a combination of all three), the fact is a flexitarian diet â€“ one that is largely vegetarian but occasionally includes poultry, meat and seafood â€“ is growing in popularity and is a long-term trend that cannot go ignored. Letâ€™s face it the flexitarian or semi-vegetarian diet is the way to go: meat and fish are becoming prohibitively expensive; our current consumption cannot be sustained in years to come; and the health benefits of a vegetarian diet are well documented. But while the number of vegetarians is significant, a study by the American Journal of Clinical Nutrition found that nearly two out of three vegetarians occasionally like to meat, chicken or fish. 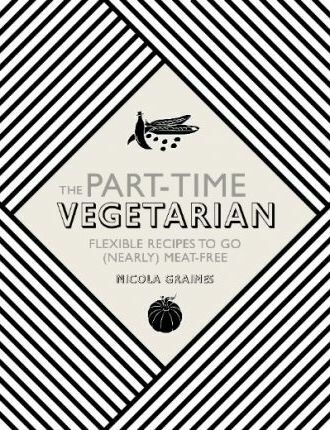 The Part-Time Vegetarian Cookbook shows just how delicious, adaptable and varied this way of eating can be. Rather than taking centre stage, meat or fish are not the main focus of the recipes, which value the often under-used and under-valued vegetables, grains, legumes, nuts, eggs and dairy foods. The recipes are not about taking something away, however, but adding a new dimension and consequently widening and extending the homecookâ€™s repertoire of dishes. Organised by meal type, The Part-Time Vegetarian Cookbook features chapters on Breakfasts & Brunches, Small Bites (snacks, lunches and light meals), Weekday Suppers, Weekend Cooking, Food for Sharing (entertaining, special occasion, celebrations and al fresco) and Something Sweet. The recipes are all vegetarian, but can easily be adjusted to suit non-vegetarians.